Derrek Carruthers was flown from Penrith Golf Club to James Cook University Hospital after having a heart attack while playing golf. The Great North Air Ambulance Service is celebrating fifteen years of being a registered charity. They're holding a special event today to mark the occasion and many of the guests are people who's lives have been saved by the charity. The Chief Executive of the Great North Air Ambulance, Grahame Pickering, says the charity wouldn't be able to run without the support and generosity of the public. The Great North Air Ambulance Service (GNAAS) was called to assist the North West Ambulance Service with a man who was having a heart attack. When the aircraft landed at the hospital in Whitehaven, the GNAAS doctor and paramedic team were able to treat the patient, who is in his 70s, before he was flown to Carlisle's Cumberland Infirmary for further treatment. His condition is considered to be stable at the moment. Three patients were 'unexpectedly saved' during a trial in which blood plasma was carried on the region's air ambulances. The Great North Air Ambulance Service (GNAA) was called to the incident at 3.30pm yesterday (August 30), and the doctor-led trauma team assessed and treated the patient before he was flown to the Royal Victoria Infirmary in Newcastle. GNAA say the flight took 10 minutes and he arrived in a stable condition. A man is critically ill in hospital after a crash on Kirkstone Pass in the Lake District. 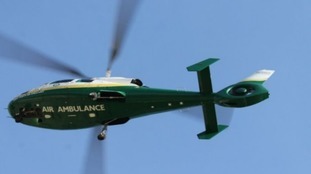 The Great North Air Ambulance were called out at 5.30pm yesterday (Friday, June 17th) after a 29-year-old man from Newcastle fell from his bike. He was put in an induced coma and flown to Preston where his condition was described as 'critical'. A 12-year-old boy has been taken to hospital with suspected spinal injuries after being hurt during a rugby match in Wigton. The Great North's Air Ambulance was called to help the ambulance service. The boy was treated at the scene before being taken to the Cumberland Infirmary in Carlisle by road ambulance. A man has been seriously injured after falling five hundred feet from Helvellyn. The Great North Air Ambulance was called on Saturday afternoon, after the man in his thirties fell from Swirral Edge into Brown Cove. Patterdale Mountain Rescue Team were also called out, as well as the coastguard helicopter. They say the man fell while descending Helvellyn. He was treated for severe injuries to his head, neck, spine and chest and flown to hospital in Newcastle. He is described as being in critical condition.